Join Litter Free Coast and Sea Somerset in the best part of the festive season – the Christmas advent countdown! This year Litter Free Coast and Sea Somerset is giving people something different to jump out of bed for —a Christmas advent calendar with a twist. Behind every door this December, you will find top tips, videos, poems and pictures all explaining how you can take care of your coast this Christmas. 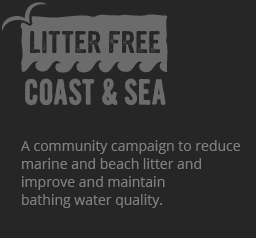 The best thing is you don’t have to live beside the sea to take part – remember that even in your home or in town what you put down the drain and the toilet can still have our coastal environment. Tips will include how to shop for the best face scrubs that don’t contain nasty microplastics, how to ditch the party plastics and the importance of keeping your pipes clear by properly disposing of cooking fat from your festive feast. The Christmas advent countdown will be on Facebook and Twitter which you can get to by following the links below. Photo competition seeks to spread the word about the importance of bagging and binning dog waste! Burnham-on-Sea is standing up to seagulls!